Our regular look at some of the names which have made the news this week. Above are SIR TERRY WOGAN (main picture), with YOKO ONO, MYLEENE KLASS, PATRICIA TABRAM and TONI COMER. 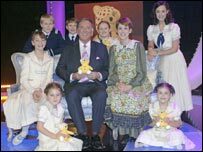 The revelation that Sir Terry Wogan has been receiving fees of thousands of pounds from the BBC for presenting the annual Children in Need charity evening, has raised a few eyebrows. There's an expectation that well-paid presenters, particularly those paid out of the BBC's licence fee, should give their services for free when it comes to charity. Yet, it was more a feeling of surprise than indignation that greeted the news that Sir Terry was taking a fee even if he has now offered to waive it. Sir Tel is not regarded in the business as a greedy man. Indeed, he has raised millions for worthy causes outside his broadcasting career. And, of all people, he hardly needs the money. He has become a multi-millionaire through his TV and radio work, not to mention his lucrative voice-overs and the proceeds from two volumes of autobiography. He once attacked the BBC for the huge amounts it pays stars like Jonathan Ross. "The lunatics have taken over the asylum," he said last year. "The culture now is that the presenter calls the financial and, increasingly, the creative shots," he added. Commenting on the £800,000 a year salary he is paid for his current radio shows, Wogan says "If you do the maths, factoring in my eight million listeners, I cost the BBC about 2p a fortnight. I think I'm cheap at the price." Sir Terry is respected for shunning the ostentatious lifestyle much beloved of modern celebrities. He lives with his wife of 40 years, Helen, in a scandal-free relationship spent at their homes in Windsor and in the south-west of France. Sir Terry has become a much-cherished national institution, not bad for one not even British. He was born in Ireland in 1938, before it became a fully-fledged republic, which allowed the Queen to award him a bona fide knighthood, not an honorary one. 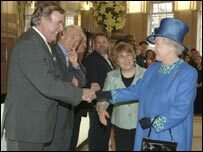 It's said that the Queen is a regular listener to his morning Radio 2 programme, Wake Up with Wogan. This would make her one of his TOGS, Terry's Old Gals. He's been doing breakfast radio since the 1960s, first with Ireland's RTE and then with the BBC's Radio 2. So popular was he that television enticed him away, with Children in Need, Blankety Blank and the Eurovision Song Contest. Here, his caustic descriptions of both contestants and hosts (he once referred to the Danish presenters as "Dr Death and the Tooth Fairy") and his irritation at the way the Scandinavian countries and the former Communist-bloc nations all seem to vote for each other, catches the mood of the viewer. During the 80s, Sir Terry's thrice-weekly chat show, Wogan, became part of the country's television furniture. Occasionally, it would make the headlines, such as when Anne Bancroft froze in what Wogan later described as a "catatonic trance", and George Best went the other way and said rather too much in a display of drunkenness. It was dropped from the schedules in 1993, partly as a result of over-exposure, and to make way for a younger generation of brasher hosts. However, Wogan: Now and Then, in which he re-visits old interviewees, still runs on UKTV Gold. So, Terry Wogan returned to his old morning radio slot. Soon he'd become the most popular presenter on radio, increasing the audience from three to eight million by taking the pulse of Middle England. The public seem to enjoy the cosiness, warmth and inclusion his programme engenders. They pick up on his jokes and jibes, hobbyhorses and whinges through countless letters, texts and e-mails. "It's all silly old childish fun, really," he says. According to the radio columnist for the Sunday Times, Paul Donovan, "Terry exudes a kind of sanity and bonhomie without affectation, deceit or conceit. He seems a genuinely nice, funny and perceptive man with a sense of humour that is very acute but not malicious." Such a great ambassador is he for his native land, this year he was honoured with a lifetime achievement award in his home city of Limerick, presented to him by the Irish Taoiseach, Bertie Ahern. So, Sir Terry has committed an uncharacteristic Children in Need gaffe, but one that's unlikely to leave a lasting stain on his career. Yoko Ono has blocked the screening of a documentary about her former husband, ex-Beatle John Lennon, in the United States. Ono's former husband, Tony Cox, shot it in 1970, the year the band split up. Lennon is seen composing songs, touring his 100-acre estate and rehearsing the song Instant Karma for a BBC show. Yoko Ono, who owns the copyright to some of the footage, is refusing to clear it for usage. The former singer with the group Hear'Say, Myleene Klass, has landed a job presenting the first film show on CNN. Entitled, the Screening Room, it will feature Hollywood interviews and film festival reports. Ms Klass rose to fame on the Pop Stars reality TV show before pursuing a classical career after Hear'Say broke up. She has since presented several TV shows including the X Factor. She said she was "overwhelmed" at her new appointment. A 68-year-old grandmother, Patricia Tabram, has been convicted of growing cannabis at her home in Northumberland. She was given a fine and a 250-hour community order despite being in breach of a six-month suspended sentence imposed in 2005. Ms Tabram, dubbed the cannabis Granny, claims to use the drug to counter depression after the death of her son, and the pain caused by two car crashes. After the hearing she vowed to continue her self-medication. A police officer involved in a fight with a drunken woman has been withdrawn from frontline duty. CCTV footage showed 20-year-old Toni Comer, who had vandalised a car after being ejected from a club at which she'd been drinking heavily, being forcibly restrained and punched five times after she had become aggressive. The officer said he was trying to deaden the woman's arm in order to be able to handcuff her. The case is to be investigated.